Forces loyal to Yemen’s exiled government retook a fifth southern province Saturday, extending recent gains against Iran-backed Shiite rebels who still control the capital. The forces backing exiled President Abedrabbo Mansour Hadi have been aided by troops and materiel from Yemen’s wealthy Gulf neighbours, as Saudi-led coalition warplanes pound rebel positions. The rebels handed over Shabwa to government forces and withdrew after being promised a safe route out of the province, a military official told AFP. Other sources confirmed the pull-out. “The province was handed over” to the Southern Movement, a secessionist group whose militants have been fighting in loyalist ranks, said Salem al-Awlaqi, a political activist in Shabwa. Officials said the pro-rebel governor of Shabwa, which has substantial oil reserves, had fled as loyalists prepared to enter the province. They also accused the rebels of booby-trapping government buildings before fleeing, as they had done in other provinces. As the rebels began entering neighbouring Baida province, Saudi-led coalition warplanes hit their convoys, destroying 13 military vehicles and leaving dead and wounded, military officials said. The sources could not immediately provide a casualty toll, and the rebels rarely acknowledge their losses. Loyalist forces in the south launched an offensive last month against the rebels, forcing them out of main southern city Aden. They subsequently retook Daleh, Lahj and Abyan provinces. 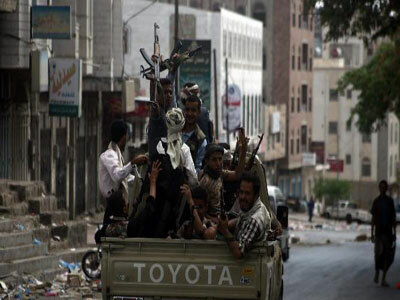 The advance is heading toward third city Taez, southwest of Sanaa, which analysts regard as the gateway to the capital, overrun by the rebels in September. After seizing Sanaa unopposed, the Huthis advanced on Aden in March, prompting intervention from the coalition aimed at restoring Hadi to power. Renegade troops loyal to former president Ali Abdullah Saleh have joined the Huthis. On the other side, the southern secessionists teamed up with pro-government troops as well as local Sunni tribes to form what they have dubbed Popular Resistance Committees. Analysts say the sweeping victories in the south are a result of the rebels pulling their forces back to Taez, where residents reported ongoing clashes. On Friday, loyalist retook several facilities from rebels in Taez, including police and civil defence headquarters, the government’s Sabanew.net website reported. Military sources say the coalition has provided Hadi’s supporters with modern heavy equipment in recent weeks, including tanks and personnel carriers, and Yemeni soldiers trained in Saudi Arabia. The conflict has cost nearly 4,300 lives since March, half of them civilians, according to UN figures, while 80 percent of Yemen’s 21 million people need aid and protection. Aid workers in the south told AFP aid groups from Saudi Arabia, the UAE and beyond began distributing much-needed food and other supplies to residents in Aden and nearby areas. The five provinces so far retaken by pro-government troops, along with Mahra and Hadramawt, which the rebels never entered, comprise the formerly independent South Yemen. It was its own state from the end of British colonial rule in 1967 to its union with the north in 1990.